The Duke Global Health Institute (DGHI) is committed to training the next generation of scholars who will lead innovative global health programs, conduct cutting-edge research, and work to reduce global health disparities. Working with schools, departments, centers, and other institutes across campus, DGHI supports a focused portfolio of research priorities on emerging global health themes, and facilitates and supports interdisciplinary programs and collaboration in the areas of research, education, service and policy. To further its research mission, DGHI began supporting postdoctoral fellows in July 2008. To date, DGHI has supported multiple postdoctoral fellows with varying specialties and geographic areas of interest. Each fellow works under the mentorship of a DGHI Faculty Member or other Duke faculty whose research focuses on one or more of DGHI’s research priorities. Currently, postdoctoral fellowships are linked directly to DGHI and faculty funding and are subject to availability of that funding. DGHI has supported postdoctoral fellows with varying specialties and geographic areas of interest. Each fellow works under the mentorship of a DGHI faculty member or other Duke faculty. Developing a global program of fellows, targeting key sites such as China, India, and other countries. Weight Loss Interventions: What Works? Eve Puffer was DGHI’s first postdoctoral fellow. 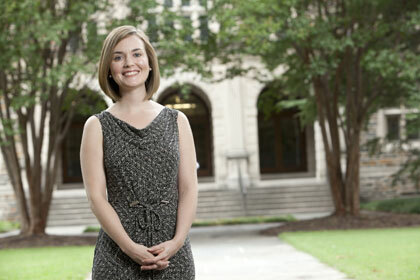 She is now assistant professor of psychology and neuroscience and global health at Duke. Postdoctoral fellowships are linked directly to faculty funding and are subject to availability of that funding.